President Donald Trump has a new idea for food stamp reform. His proposal is part of the 2019 fiscal budget and would replace about half of the money families receive from the Supplemental Nutrition Assistance Program (SNAP), POLITICO reported. The Department of Agriculture is referring to the proposal as "America's Harvest Box," which would provide families with food that is 100 grown and produced in the United States. Families who receive $90 or more per month in SNAP benefits would receive part of their food stamps in the form of the boxed food, "which would include items such as shelf-stable milk, ready to eat cereals pasta, peanut butter, beans and canned fruit, vegetables, and meat, poultry or fish," the proposal outlined. The additional amount of the families food stamp benefits would go onto their Electronic Benefit Transfer (EBT) card for them to use at grocery stores. "This cost-effective approach will generate significant savings to taxpayers with no loss in food benefits to participants," the proposal said. 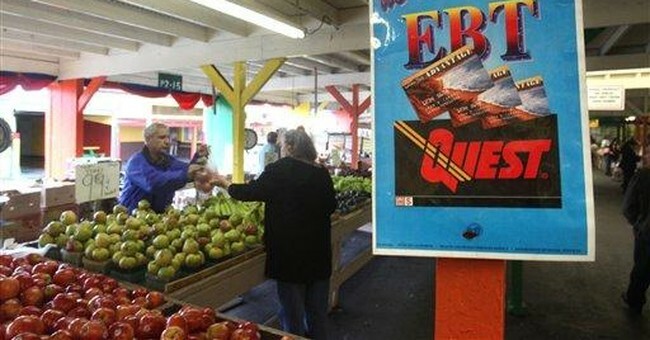 "It will also improve the nutritional value of the benefit provided and reduce the potential for EBT fraud. States will have substantial flexibility in designing the food box delivery system through existing infrastructure, partnerships, or commercial/retail delivery services." The United State Department of Agriculture believes this would save $214 billion over 10 years while providing healthy food for low-income Americans, Bloomberg reported. The proposal fails to mention how families would receive the food boxes but instead puts that burden on the states to "distribute them through existing infrastructure, partnerships or directly to residences through delivery services," FOX 6 reported. Stacy Dean, vice president for food assistance policy at the Center on Budget and Policy Priorities, told CNN: "It's a risky scheme that threatens families' ability to put food on the table." The Food Marketing Institute — which represents major stores, like Walmart, Kroger, Albertsons — is doing everything in their power to advocate against this proposal. It's no wonder why. Tens of billions of SNAP benefits are spent each year in their stores. And, of course, the grocery industry is arguing the food boxes would be inefficient. According to Jennifer Hatcher, the Food Marketing Insitute's chief public policy officer, grocery stores worked with the USDA and Congress over a number of years to “achieve a national system, utilizing existing commercial infrastructure and technology to achieve the greatest efficiency, availability and lowest cost," POLITICO reported. The Trump administration pointed out one very important point: the USDA already distributes food commodities to schools, food banks and other organizations who then hand the food out to low-income families in need.